I’ve been addicted to stationery for as long as I can remember. I have scores of pens, pencils, mechanical pencils, and assorted coloured markers. When I’m asked which are my favourite writing implements, my answer is a constantly-varying set of five or more. I also have dozens of notebooks. Some are brand names, some are handmade in small batches, some are pocket-sized, and some take up most of my desk when they’re lying open. Few are ever finished before I move onto another. I love stationery. I find it so much easier to think when I’m using pen or pencil on paper, away from the various glowing screens around me. I recently wrote about the joy of handwriting, but even just jotting down a few bullet-points as a to-do list is far more enjoyable with tactile materials. When I’m writing on paper, I feel like the drag-force and cognitive constraints of digital creation have been lifted. I’d like to share that passion for stationery with you, in an occasional series of articles here. I’ll talk about one writing implement and one notebook each time. I’ll provide some photos to give you a feel for the items, including something for size comparison, and of course a writing sample for each pen or pencil. In each case, I’ll choose a Dire Straits lyric to include as part of the sample, just for fun. Since this is the first such article, I want to talk about my constant companions: the notebook and pen that I take with me everywhere, from the local coffee shop to the far corners of the world. 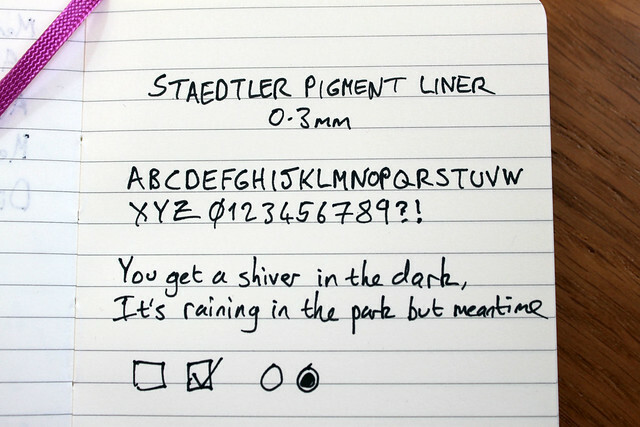 My daily writing tool of choice is the Staedtler pigment liner. These are my most beloved pens. They come in a range of tip sizes, from 0.05mm to 0.8mm, but my chosen size is the 0.3. It’s thick enough to make beautiful, bold strokes on the page, but also narrow enough to be great for handwriting too. You can buy these pens on Amazon UK, and Amazon.com amongst other places. The pen is 13.7cm long (which is a normal sort of length), and weighs about 9g (also normal). It’s easy to hold, with the lip between the barrel and tip providing a natural grasping point. The tip sheath is metal, which makes it ideal for using with rulers or templates, and the ink is a full and dark black. It’s quick to dry, indelible on paper (erasable on film), and is lightfast and waterproof (again, on paper). The cap can be left off safely for 18 hours without drying out. The pen is also aircraft safe, i.e. it will equalise pressure to avoid ink leaks. There’s a metal clip on the lid, and a stud on the end of the barrel to hold the lid when it’s off. I prefer the balance without the lid attached, but that’s a personal choice. Each one lasts a very long time: under moderate daily use, it’ll go for months. Both barrel and cap are prominently marked with the line width. 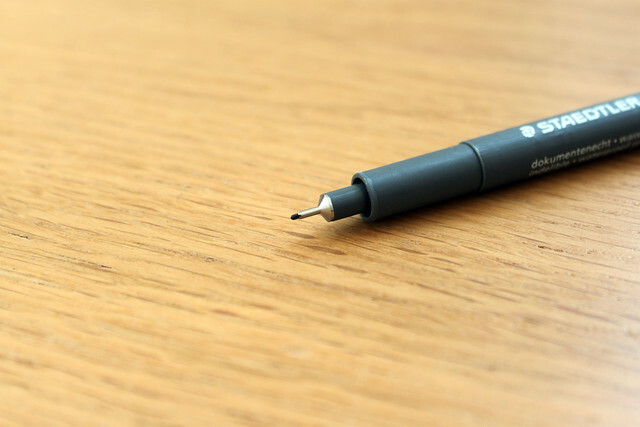 The 0.3mm is a very smooth writer, with no scratchiness or stuttering. Ink flows smoothly and evenly, depositing plenty onto the paper without smudging. There’s none of the bleeding that some gel pens suffer from. The ink is dark, as I mentioned, so there’ll be some show-through, but it’s minor even on thinner papers like that in Moleskine notebooks (about which more later). The ink won’t bleed when highlighted either, which is a big bonus. 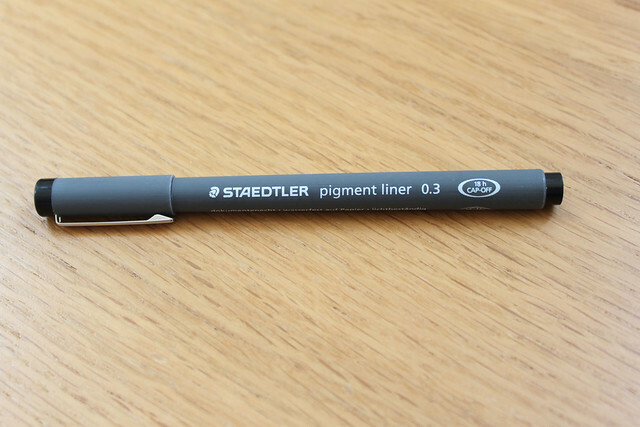 If you like the action and balance of the pigment liner but need a range of colours, there’s a similar Staedtler range called the Triplus fineliners, which come in a rainbow of colours. Always stick to the pigment liner for your blacks though. 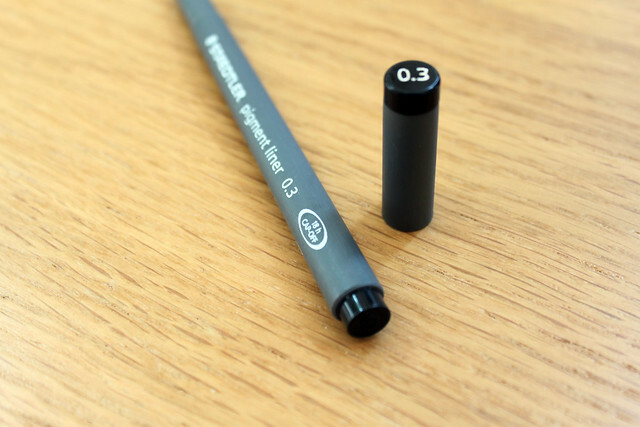 I find the pigment liner to be the ideal pen, whether I’m writing or drawing. I stockpile these things, and I hate to be without one. 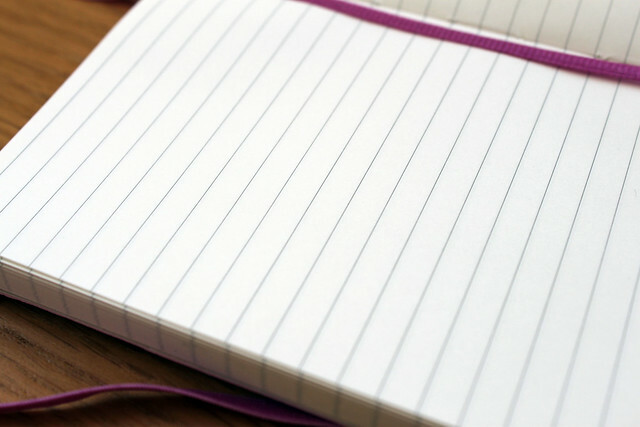 Almost everyone has heard of Moleskine notebooks, so I’ll spare you the sales blurb. They’re not the cheapest things out there, but they take a beating and they’re exquisite to use. I have Moleskines in several sizes, but today I’ll talk about my carry-everywhere pocket-sized soft covers. You can buy Moleskines just about anywhere now, including Amazon UK and Amazon.com. The first thing you’ll notice is the rounded corners, which appeal to me aesthetically. 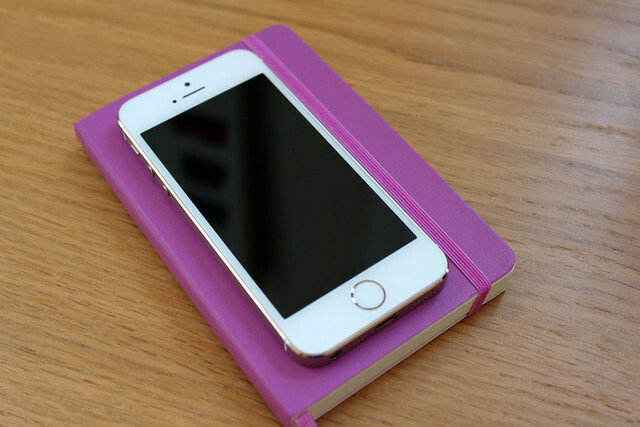 They also have a practical purpose, preventing snagging in your pocket or bashed and tatty corners on the notebook. The size is ideal for the back pocket of your jeans, or (my personal preference) the inside breast pocket of a blazer or coat. The covers feel like supple leather, not vinyl. Next up is the all-important paper. 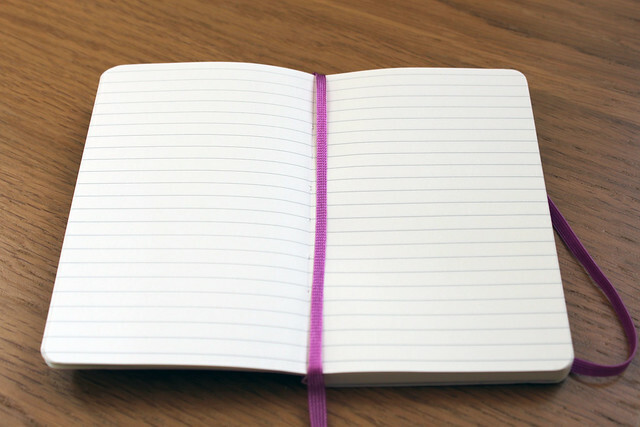 Moleskines have bleach-free paper, which ought to last for a very long time indeed. It’s ivory in colour (that’s a slightly yellow, off-white shade), and very smooth to the touch rather than the mild roughness of printer paper. It takes ink very well indeed, without bubbling or spreading. I love the soft cover versions because they’ll readily sit open at any page with minimal encouragement (Moleskines are also bound to specifically facilitate lying flat), and they’re slightly thinner and lighter than their hardcover counterparts. If you look carefully, you’ll notice in the photo above that I’m only a few pages into this notebook, yet it’s lying flat comfortably. The soft cover allows considerable bending with your body if it’s sitting in a pocket, so it’s not going to be a pain. It’ll go back into shape readily enough too. 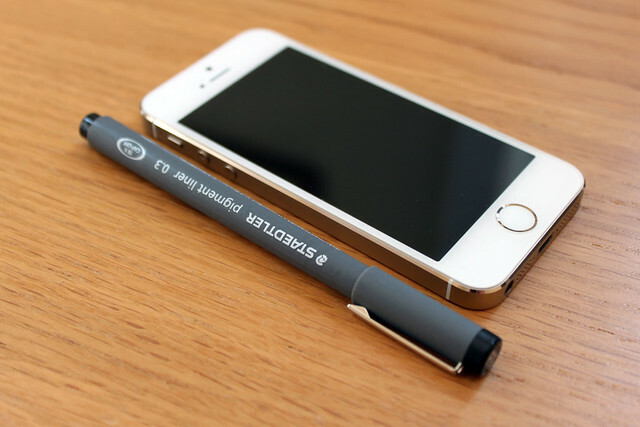 There are a few nice features that I really appreciate, besides the paper and the portability. Moleskines have a card pocket on the inside back cover, where you can store small items like tickets or receipts if you feel the need. You’ll also find the Moleskine genesis story in there - once you start collecting Moleskines, you’ll end up finding those little leaflets lying around the house where you least expect them. 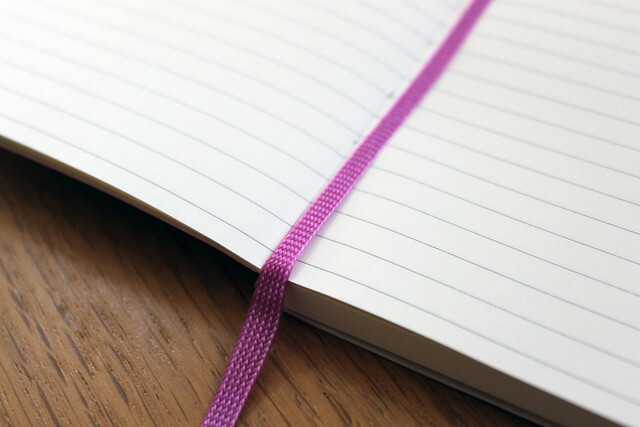 Of more constant use, though, are the attached elastic band, shown in previous photos, to hold the notebook closed (and clip a pen onto), and the fabric bookmark sewn into the spine. Obviously, you keep your place with the bookmark as you go, removing the need to thumb through the pages. 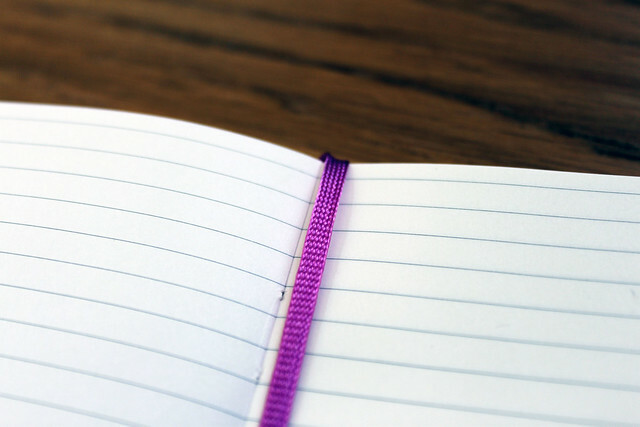 In the coloured versions (like this gorgeous Orchid Purple one), the bookmark and band take on the cover’s colour too, making for particularly beautiful notebooks. 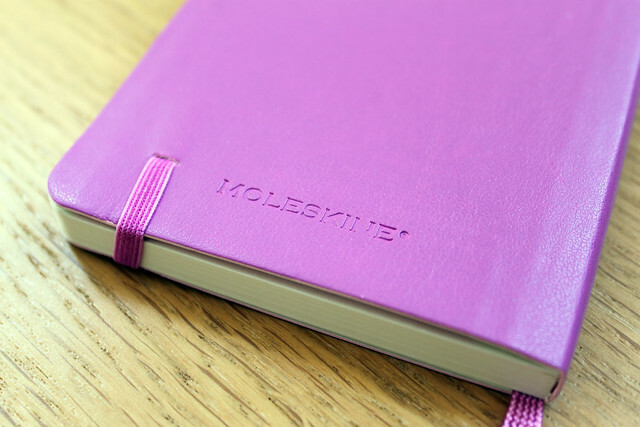 Moleskine soft cover notebooks are lightweight, beautiful, functional and portable. I almost always have one on my person, and a couple of backups ready to go in my office. The default colour is black as usual, boringly, but there’s an ever-changing range of other colours available, which differ between the hard and soft cover editions. I can also strongly recommend the large size (roughly like an iPad mini) as a journal or planner, and the extra large (like a regular iPad) for sketching and design work. They come in plain, ruled, squared and in some cases dotted variants, as well as a host of special-purpose versions like diaries, watercolour art books, travel journals and more. I’m a fan of the ruled versions for general use, but you’ll want squared if you’re going to be doing UI sketches, designs and suchlike. It’s my view that if you’re going to carry something through life with you, it should be the most beautiful and pleasurable object you can find. That applies to my phone, my laptop, my wristwatch and most definitely my notebooks and pens. These two beautiful pieces of stationery are my favourite writing combination, and have been for several years. If you’re looking for a very comfortable, affordable and readily-available intro to an obsessive collection of pens and notebooks, grab yourself a few pigment liners and a Moleskine. You won’t regret it. If you enjoyed this article, do feel free to feed my insatiable stationery habit via my Amazon Wishlist. I’ll review anything I receive, and I’ll be most grateful. You can also support my writing. I’ll be talking more about stationery in future. Until next time, keep writing.